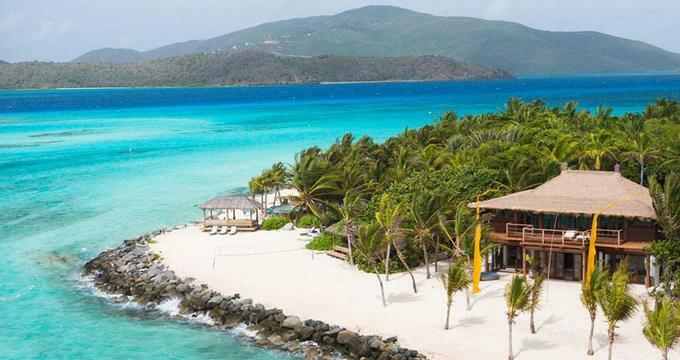 Necker Island is one of the most famous private island resorts, located in the British Virgin Islands. This dream beach resort in the Caribbean is run like a private residence where guests are free to decide what to do, what to wear and when to dine. The hotel a staff of 31 and can accommodate up to 26 guests. The island is owned by British entrepreneur Richard Branson. The resort can be rented on a daily basis when it is not being used by its owner. During special seven night Celebration Weeks, usually in September and October, island accommodations are available to couples on a weekly basis. The 74-acre island has a ten-bedroom Balinese villa and two one-bedroom Balinese houses - "Bali Hi" and "Bali Lo." The houses each have a private swimming pool and open-air lounging and dining areas. "Bali Cliff," attached to "Bali Hi," is a bedroom that hangs over a cliff with spectacular views of the Caribbean. The Main House has a master bedroom with Jacuzzi and nine bedrooms with private bathrooms. The villa, set on top of a hill with spectacular views of the island, has a large reception area, a spacious terrace, swimming pool, Jacuzzi and a waterfall. The island is surrounded by coral reefs and very private. There are many species of birds since part of the island has been designated as a bird sanctuary. The island has beautiful sandy beaches where guests can snorkel, kayak, sail, water-ski and windsurf. Scuba diving and deep sea fishing are available at additional cost. Hire the new Necker Nymph for a day and explore the underwater world. Guests can dine in the dining room or anywhere else on the island. The chef serves dishes that incorporate locally grown produce and can accommodate special guest requests. Designed especially for Virgin Limited Edition, Necker Nymph is a relatively new addition on the island. The "aero submarine" is a sort of an "aircraft" but instead of flying it submerges. There is no better place to go 100 feet under water and observe colorful marine life. The BVI offer clear Caribbean waters, colorful fish and pristine coral. The submarine is piloted by a trained pilot who takes two passengers, sitting on either side, as deep as 100 feet (30 meters) below the surface. Unlike other submarines, there is no glass between you and the water. You get a supply of oxygen and a mask. The submarine travels at speeds of up to 6 knots underwater. Dives typically last 40 minutes. Divers have to be at least 10 years old and need to receive basic dive training (available on the island). If you hold a PADI Open Water Diving certification, you are good to go. The submarine is available to guests staying on the island - you can book your dive when you book a stay on the island. Daily rate is US $2,500. Some of the highlights include ancient shipwrecks, and side-by-side cruising with dolphins and whales. You won't be slowed down by fins, so if there is a pod of dolphins, the submarine will be able to give you an incredible underwater view of these stunning creatures. Necker Nymph features low light and noise emissions to leave minimum environmental impact. Rates start from $22,500 per day. If you are planning a honeymoon getaway, seven night Celebration Weeks cost from $19,500 per couple per week. The rate includes all meals and drinks, tennis, gym, windsurfing equipment, laser and catamaran sailboats, wake boarding, snorkeling gear, sea kayaks, aqua trampoline, boating excursions and water sports instruction. The resort also provides round-trip launch transfers between Necker Island and Virgin Gorda or Beef Island before 4:30 p.m. The B.V.I are reached via Juan, St. Thomas, U.S.V.I. or Antigua with connecting flights into either Beef Island or Virgin Gorda airports.